Gold Strike is a newly released slot game from Playtech that has already become a hit with players. Gold Strike does a brilliant job of transforming the player back to the Wild West, where players must shoot cans and detonate mine shafts in the bonus rounds to win cash prizes. The graphics are cartoon like and very colourful, with great sounds and traditional Wild West font styles, making you think that maybe you really are a cowboy looking for gold. 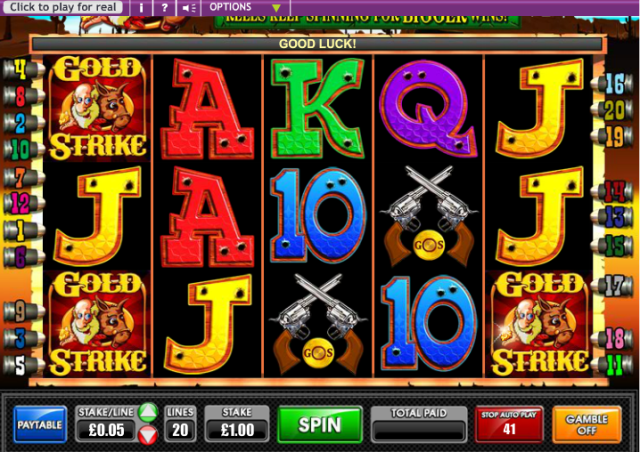 Gold Strike is 5 reel, 20 payline game and allows players to bet anywhere from 20 pence all the way up to £400. There’s also an option to try the game out for free before paying for cash! Gold Strike has a great average return to player (RTP) of 95%, and games can be played in Euros and GBP. To win, players must match 3 or more identical reel symbols on the same line, or have 3 or more Dynamite scatter symbols on the screen. Every payline symbol must be on the same line and successive reels will began from the reel on the left. A Sheriff’s Badge within the game is wild, and all other symbols barring the Dynamite symbol. To unlock the Lock ‘N’ Load bonus, players must win on any reel. This will then trigger the slot to keep spinning (locking the winning symbols in place) until the reel cannot improve any more. The Tin Can Alley Bonus is unlocked when a player manages to get 6 or more Dynamite scatter symbols in view. The player will be shown five cans, and under each can is a cash prize. The Lucky Strike Bonus is unlocked only when the player finds the correct symbol under a can in the Tin Can Alley Bonus. Then the player will be shown a map that’s hidden with Lucky Strike symbols and “X” marks. If the player lands on an X, the bonus is over, if they land on a Lucky Strike, they win a cash prize. The Gold Mine Bonus only occurs when the player during the Lucky Strike Bonus manages to trigger the correct Lucky Strike Symbol to take them to the next bonus stage. If successful, the player has to pick between three detonation triggers to unlock an even bigger cash prize in the Gold Mine Bonus. We really had a fun time paying Gold Strike, if you love the wild west this is the game for you. The game is easy to play, very fun, and if you can get yourself to the Gold Mine Bonus level, big cash prizes can be won. Gold Strike can be played at PaddyPower Casino and SkyVegas. If the wild west is not your thing, check out our other amazing slot machine games on our home page.